When you arrive in Chiang Rai, you will be met and transferred to your hotel. Chiang Rai is a smaller and less commercial city than Chiang Mai and retains much of its original character and charm. One of its more striking landmarks is the Golden Clock; designed and donated to Chiang Rai by the artist Chalermchai Kositpipat creator of The White Temple. At the strike of 7pm, a flamboyant light show ensues, accompanied by music. Other more traditional attractions include the Hill Tribe Museum and Education Centre, several beautiful Wats, Mae Nam Kok River, and a night market with free Northern Thai music and dance performances. After breakfast, there is the one and only vehicle transfer of the tour to Mae Sai, the Northern most point in Thailand. Mae Sai is a fascinating border town with a bustling market where you can buy an array of imported goods: cheap jewels (rubies, emerald and jade) from Burma, curio items, many of which are imported from China, fresh fruit, electronic goods, clothes and shoes, and sandalwood. 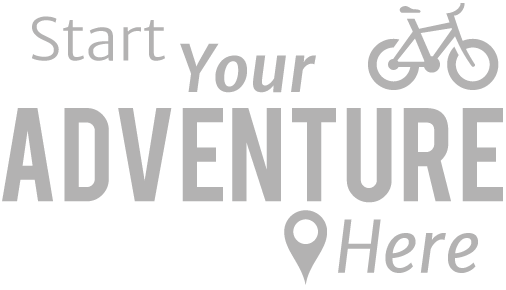 After a quick look around, we will start our cycling adventure with a short warm up ride through the famous Golden Triangle: the point where 3 countries (Thailand, Burma and Laos) and 2 rivers (the Ruak and the mighty Mekong) meet! 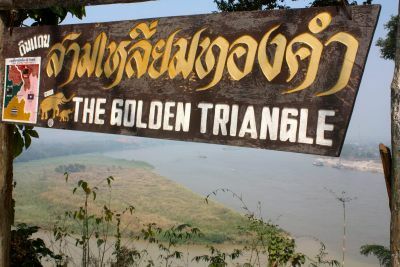 The English name Golden Triangle comes from a CIA memo relating to the region’s notoriety in the 1920s as one of the world's most prolific opium producers, nowadays a tourist destination. Locally the area is known as Sop Ruak. The ride begins on paved road through a scenery of gently rolling hills. We pass many pineapple plantations out our route to Chiang Saen. We will make a stop at the Buddhist Wat Phra That Chedi Lunag for a quick visit before following the ancient Chiang Saen city walls into the town to reach our guest house. Chiang Sean is an historic city with numerous temples, historic buildings and ruins. Following the Mekong river, we ride through lush jungle passing picturesque hill tribe villages characterised by simple bamboo huts on stilts. Under the huts women can often be seen weaving and children play alongside chickens and pigs. We arrive at Chiang Khong, the border crossing point from Thailand into Laos early afternoon. Today the cycling starts to get tough as our route continues the ascent to Phu Chi Fa the highest peak in Chiang Rai province. Remember the support vehicle is on hand if you need to take a break. As we ascend the views are spectacular, and the terrain rewarding. Look out for children carrying baskets full of crops on their backs and give a thought to the fact that they don't have any gears and more than likely, no shoes! Phu Chi Fa is stunning and surprisingly chilly; it becomes very cold in the winter months. The diversity of insect life, flora and fauna make it a unique area of Thailand. Visitors are largely Asian, mostly from more Southerly Thai provinces; very few Westerners are seen here. For a truly exhilarating experience we recommend an early start at 4am, to make the trek on foot to the highest point of the mountain before sunrise. The effort is more than rewarded as we watch the sunrise over mist-covered jungle with the Laos border and the Mekong far beneath us. When you return for breakfast you'll be feeling fantastic. Do not forget your camera! Although we make an early start, we have an easier day of cycling. 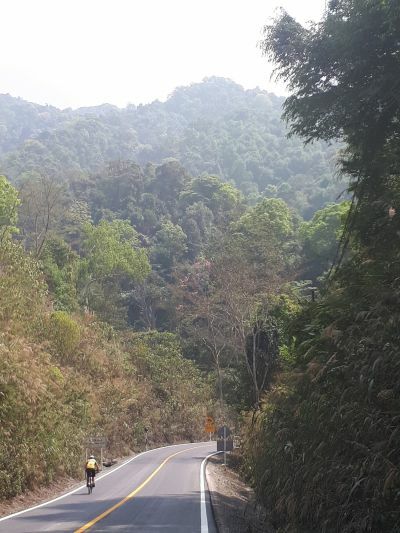 We set off downhill, hugging the mountainside and following the Thailand Laos border on rougher surfaced curving road, passing Phu Sang Waterfall; a thermal spring that cascades dramatically off the mountain. Continuing our journey we reach our hotel in Chiang Kham. We can take it easy today and relax in our beautiful surroundings. Chiang Kham is home to many Thai Lue or Tai people, an ethnic group that originated from southern China’s Yunnan province and spread over many northern Thai areas. Most Thai Lue communities are now resident in Nan and Phayao provinces. There is a Thai Lue Cultural Centre near to our hotel, where you can learn about culture, traditions and history. There are also several local temples of interest: Wat Nantaram, Wat Phrachao and Nang Din. Today we begin cycling a gentle uphill route following snaking road from Yoan through a vast expanse of rice fields to reach our destination. We follow a series of rolling hillls, some of them quite steep. There are many traditional temples and teak house villages in the area that we pass through. Around Phu Lang ka there is an abundance of wild flowers. Our accommodation tonight is simple, the main feature of your time here will be the stunning early morning views. You will also have the opportunity to learn about Yao culture. It is worth rising early this morning to witness the breath-taking sunrise. 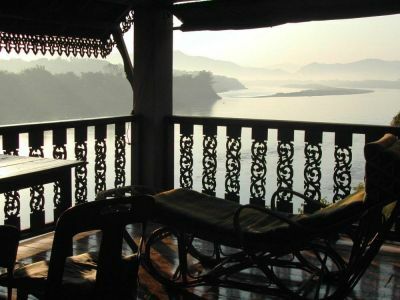 Often shrouded in early morning mists the stunning landscape of karst rocks, mountains and valley emerges with a quite magical aura; on a clear day, you will glimpse Laos in the distance. The area has been described as the Ha Long Bay of the mountains. Setting off with a drop downhill we have a challenging cycle today towards Pua a small, busy town set in a wide, fertile valley with beautiful views to the east, of Doi Phuka national park where the peaks are just shy of 2000m. 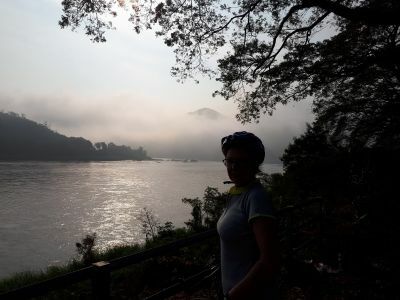 We leave Pua cycling through beautiful jungle greenery, beginning a challenging steep climb over the mountain passing Doi Phuka National Park, an expanse of evergreen mountainous parkland. For the final stretch of today’s ride we drop downhill to the tiny Htin village of Bo Kluea in a scenic valley; we are now in the far northeast of Nan province, close to the Lao border. Bo Kluea in Thai means salt well. The village is built around two natural saltwater wells and traditional salt mining can be seen still in practise. Very few foreign visitors make it up here so Bo Kluea retains an authentic, unspoiled character. We will provide transport today if people want to visit Doi Phuka national park. A number of minority communities live in the park area including Hmong and Thai Lue . As well as caves and waterfalls in the park there are rare varieties of tree that can’t be found anywhere else in Thailand. The chomphu phuka gives the park its name, bursting into pick flowering blooms every year in February. Tree fern caryota gigas and Acer wilsonii are also unique to the area. Nearby is Nong Bua village set among rice-fields along the Nan River and home to an interesting wat, a small Thai Lue museum and a classic-style Thai Lue house that is open to the public. Around 10 km south of town you can visit the three tiered Silaphet waterfall. Also nearby is the Royal Phu Fa project, which supports Mrabri people, a formerly nomadic minority, who settled and learned to farm rice. In Phu Fa, the Mrabri grow tea and mulberries, and make handicrafts from bark which are on sale in the project shop. At the Phu Fa cultural centre there is a walk explaining forest life and the traditions of the Mrabri people. Our route today from Bo Kluea follows classic twisting roads with little in the way of traffic as we head the capital of Nan province, also called Nan. For centuries Nan was an autonomous region with few links to the outside world. This beautiful town with many well-preserved temples is a perfect place to end our adventure. You will have time to visit Wat Phumin the area’s most well-known temple. Built in 1596, as if it were on the back of two immense snakes it has four entrances, with a small corridor leading to each door. The interior of the temple is inspired by Thai Lue architecture. There are twelve teak pillars decorated with gold, black and red lacquer elephants to support the heavily decorated roof and some magnificent murals that still retain their original artwork. There is also an interesting national museum in Nan. This evening we ill gather together for a farewell celebratory meal. The tour ends today. There will be a transfer to Nan airport for your return flight home via Bangkok. 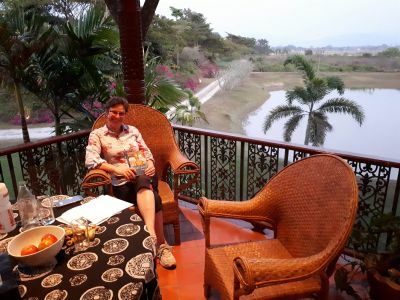 "This was our first trip, both with redspokes and to Thailand, so we didn´t know what to expect when we arrived to Chiang Rai where we were met by our..."